Shale Gas Review: Fracking’s future dependent on hazardous waste loophole Anti-fracking strategy in NY: Ban or death by regulation? Fracking’s future dependent on hazardous waste loophole Anti-fracking strategy in NY: Ban or death by regulation? The viability of shale gas production in New York may hinge on a critical policy question: Will chemicals regulated as hazardous material when shipped to well sites and injected into the ground be regulated as hazardous waste when they flow back out? This question cuts to the crux of risk analysis of high volume hydraulic fracturing – a process that injects chemical solutions into well bores under high pressure to fracture bedrock and release gas. The process – commonly known as slickwater fracking -- is exempt from federal hazardous waste laws that require stringent handling, tracking, reporting, and disposal requirements for certain chemicals under the “cradle to grave” protocol spelled out in the federal Resource Conservation and Recovery Act. Because of the RCRA exemption, drilling waste is classified under the less stringent rubric of industrial waste or solid waste, therefore making it easier to dispose of or recycle by conventional means. While the exact chemical formulas for fracking a given well are proprietary, the New York State Department of Environmental Conservation lists the broad universe of fracking chemical families – many of them hazardous substances -- in a draft of the state’s permitting policy, called the Supplemental Generic Environmental Impact Statement (SGEIS). The list includes several hundred compounds – such as trimethylbenzene and acetone -- discussed in Section VI, page 6-16 under “Hydraulic Fracturing Additives” and itemized in Tables 5.7, 5.8, and 6.1. But even if the state has the legal authority to close the federal exemption for operators in New York, that doesn’t mean it will be compelled to do so. No other states have attempted to exceed the federal regulatory framework for drilling waste disposal, and any attempts by New York to raise the regulatory bar would face strong opposition from the industry. Tom West, an industry lawyer, said taking away the federal hazardous waste exemption in New York could hypothetically be done with the appropriate rule-making process, including public input, but there was no reason for it. Drilling waste, according to West, “has never been found to be a problem,” and closing the exemption would be a “scarlet letter” that would effectively discourage the industry from operating in New York. Other reports highlight risks from a lack of controls for fracking waste disposal. A statistical analysis published in this month’s the journal “Risk Analysis” found the disposal of fracking waste to carry higher risks to water supplies, by several orders of magnitude, than pollution from other pathways. Risk factors include “epistemic uncertainty associated with hydraulic fracturing wastewater disposal,” according to the study by Stony Brook University authors Daniel J. Rozell and Sheldon J. Reaven. Gov. Andrew Cuomo has said the state DEC is expected to finalize its permitting guidelines “by the end of summer.” (That date remains a matter of speculation, as Cuomo continues to be vague with reporters attempting to pin him down, and he has added on more than one occasion that the DEC is not working on a specific timetable.) Still, the anticipation that a moratorium on the permitting of shale gas wells in New York will soon be lifted has spurred a rush of eleventh-hour activity by anti-fracking groups urging municipalities and the state to ban fracking. The modus operandi of grass roots groups, such as New Yorkers Against Fracking, includes protests, demonstration concerts, marches, petitions, and letter writing campaigns. The latest manifestation of this effort includes a three-day event in Albany scheduled this weekend. The event, called Don’t Frack New York, includes two days of “training and strategy sessions” for those pledging to be part of the anti-fracking movement, followed by a March on Albany on August 27. (Note corrected date: The original version of this blog incorrectly listed the event over the Labor Day weekend.) It is lead by high profile environmental activists including filmmaker Josh Fox, and authors Sandra Steingraber and Bill McGibben. The most active grass roots fracking supporters, meanwhile, have been landowners eager to lease property to gas companies, while believing the financial gains will lift entire communities out of economic doldrums. Sometimes backed by local business groups and law firms, they have formed coalitions campaigning on behalf of the industry with tools ranging from bumper stickers and road-side placards to a movie of their own, produced by the industry trade group Energy In Depth, called Truthland. The drilling industry has also been active through lobbyists, including West, through advertising in print and media, and trade groups, such as Energy in Depth, who have been going head to head with the anti-fracking movement in a war of words waged on list serves, blogs and forums. While the anti-fracking grass roots groups have been conspicuously public with their posters and marches, institutional environmental organizations such as the NRDC and Earthjustice have taken a lower profile while waiting for the state to complete its review. While the NRDC operates globally on an annual budget that exceeds $100 million, the agency’s stance on fracking may be shaped by the controversy that is center stage in New York. The NRDC has pushed for regulations to control fracking, but that approach has drawn criticism from grass roots organizations in New York that are seeking nothing short of an outright ban. New Yorkers Against Fracking – which has argued that the state’s review process fails scientific muster in evaluating the risks and impacts of fracking – has criticized NRDC for suggesting the state consider a plan to begin fracking on a trial basis in certain parts of the state while prohibiting it in others. The plan was included as one of many considerations itemized in NRDC’s response to the SGEIS. It’s noteworthy that the NRDC’s New York state web page now features The Sky is Pink, a film by Josh Fox (producer of Gasland) that urges Governor Cuomo to ban fracking. NRDC’s alliance with Fox and his work highlights the amorphous and evolving position main stream groups have taken on the issue. The Sierra Club once accepted millions of dollars from Chesapeake Energy as it built a campaign that included promoting natural gas as a bridge fuel from coal to renewable energy. It changed its position as the anti—fracking movement showcased the risks of fracking, including threats to water supplies and a culture and history of non-disclosure and exemptions. A hazardous waste classification could be a strong and perhaps insurmountable deterrent to fracking in New York. The classification would apply to the flow-back from each well – typically several million gallons, times tens of thousands of wells potentially drilled in the state. The more stringent handling and disposal laws would make it much more difficult for the agency to get rid of the waste by re-injecting it into the ground, shipping it to non-certified landfills, shipping it out of state, or passing it through conventional treatment systems for re-use or discharge. In briefings with environmental groups, the DEC has shared ideas under consideration to regulate the industry. They include on-site inspections and water monitoring wells around gas wells. Also under consideration is “green completion,” which would require pipeline infrastructure built in advance of drilling. Green completion would reduce risks associated with leaks and discharges – including emissions from flaring -- from pressure building in wells that are freshly producing but yet to be tied into pipelines. Tom, the expression that some of us hatched up four years ago on a drive back from Albany was "strangulation through regulation", it has a nicer ring to it. No economic reason to drill shale gas wells in NYS this year, or next or ? Truly enjoy your blog. As an Illinois resident I'm curious to see what's going to happen with shale development in New York. Illinois is in the early phases of development of the New Albany Shale located in the southern portion of the State. My guess is that our governor Pat Quinn is waiting to see what happens in NYS before making a move. Anyway, now to my point. A big concern of mine with fracking-fluids regulation is groundwater remediation. 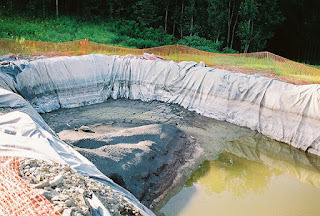 In NYS where the shale is relatively shallow, impact may occur whether from surface spills, casing leaks or rogue fractures in communication with the aquifer. Remediation requirements stem from laws like RCRA; waste declaration like Special and Hazardous; and site specific risk assessment. I can't figure out from Pennsylvania or the NYS dsgeis how groundwater contamination is addressed regulation wise? Interestingly, groundwater cleanup levels are land-use dependent, i.e. residential, commercial, industrial or agricultural. So deeding, deed restriction and deed changing becomes a very big issue. I was browsing through blogs and got hold of yours. I think this is a much sorted text and I would like to follow up on this. There are variety of factors that help keeping the environment and surroundings clean, first and not the least is Hazardous Waste Disposal management. We must care for our own and other neighbor's as well. Its too sad that companies sometimes think about their business alone. They sometimes do not consider the proper Hazardous Waste Disposal. Too sad. Thanks for your great and social service about Clinical waste. I like your job very much. I always thinks this system and service very need for worldwide. Some days ago i have gotten this related site and has many only support..